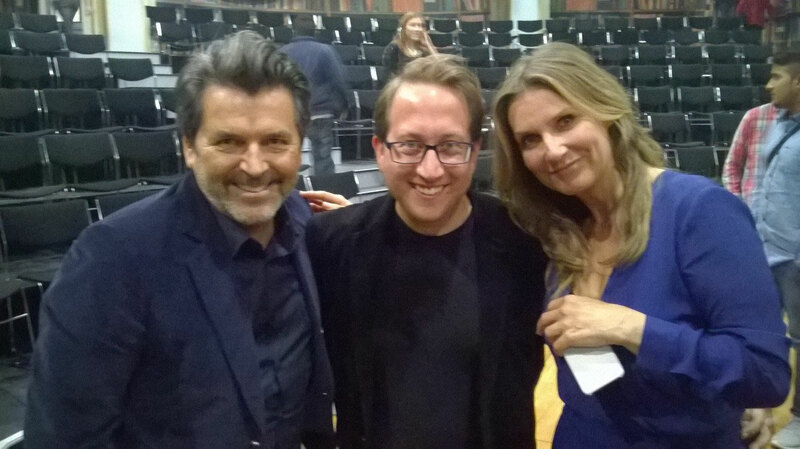 Thomas on "Hirschhausens Quiz des Menschen" - Thomas Anders Online - Die offizielle Fanpage! Wednesday, the 29th of April 2015 – this time I was early enough to be there on time, because on late afternoon is rush hour in the city of Cologne. Whether we could make it on time? Whether Andreas will arrive on time? Whether we can get our tickets and most of all, what kind of show is it, in which we will see our Thomas? Like always with big anticipation and with with some good friends I was on my way to this event with Thomas Anders. 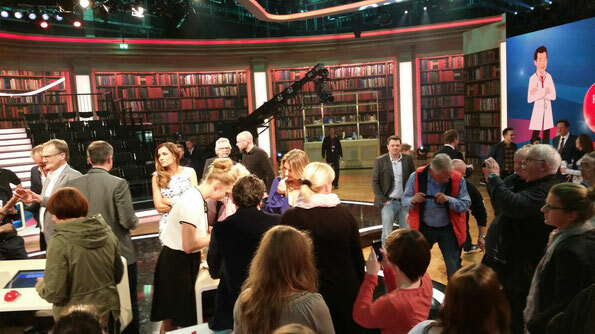 Today he is guest of Dr. Eckart von Hirschhausen on “Quiz des Menschen” at ARD (Ersten Deutschen Fernsehen). Thomas is a well-seen guest in quizshows, so I had no sorrows, that he will be great. At this time, I am not allowed to tell you, whether he finally be in the winning team. Back to the quiz: What is the show of Dr. Eckart von Hirschhausen about? I have to say, it has a very appealing concept. It’s not about simple showbiz questions, that everyone can answer easily, who has a bit general knowledge of television things. It is ambitious and absolutely interesting. I almost can say: I have learned something. The designation Game- and knowledgeshow is more fitting. We really had great seats. Right behind the team of Kim Fisher and Thomas Anders. The first round was one of my favorites. The guys from the three teams had to dance behind a wall at the whim of their own. A special camera showed the ladies just a computer animation. Now they had to guess, who is who. Not that easy, when you just see a stick figure. But: People, a real fan really knows how his star is moving. Our Thomas began to dance; Andreas and I looked at each other, nodded both and confirmed: This is Thomas!! And….we were right! Yes! Apart from that, he did the best job in dancing! How sensational you can dance Salsa at the age of 80, what is really great about the page www.sozialhelden.de AND why red fingernails become so to Thomas Anders, Frank Plasberg and Alexander Herrmann are further topics of this evening. It gets funny, I promise. The show can be seen on the 21st of May 2015 at 20:15 in the ARD (Erstes Deutsches Fernsehen) and I definitely will watch it. And you should do the same! Like always, everything is over too fast. But I am very happy about the nice evening. After the show, the audience got the opportunity to make some photos with the prominents. 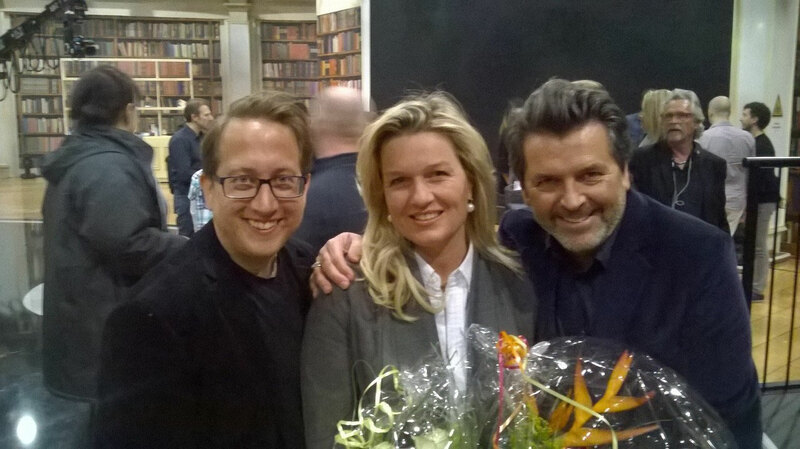 So I did and got the chance to make a photo with the team Kim Fisher and Thomas Anders. I admit that I hoped to give the "Birthday Girl" Claudia some birthday wishes personally; we specially brought her some flowers. A Birthdaygreetingsflowerspresentationpicture* with Claudia and Thomas was the highlight for me!!! Thank you for being the way you both are! Simply great!